At first you wouldn’t recognize Dan Benson as the minister of St. Paul’s United Church. On Sunday morning as soft organ music wafts through the sanctuary, an affable guy in sports shirt is chatting with members of the gathering congregation. Like a bumble bee, he darts frenetically about, sometimes laughing, sometimes serious, mentally noting the concerns of his flock to address at a later time. He is equally comfortable with both old and young and everyone in between. Kids call out, “Dan, Dan…,” never Reverend Benson, to tell him something important like their birthday is coming up or they just got a new puppy. He may ask them to be an impromptu participant in that Sunday’s service along with anyone else he can snag. He is always brimming with ideas, so when he makes a bee-line for you, you know he is going to cajole you into participating in the life of the church by doing a reading or heading up a committee. Dan is a strong democratic leader and knows how to delegate responsibility. However, he is not above the mundane such as unclogging a toilet innocently blocked by a child’s toy from the Sunday school room next door. You may have asked yourself (or not), “So what does a minister do all week anyway?” Being the pastor of a church is more than a Sunday morning gig and not a 9 to 5 job. It requires a knowledge of: theology, psychology, human relations, current events, business administration, technology and building maintenance. He has an undergraduate degree from U. of T. in Religion and Art, a Masters of Horology (look it up) and a PHD in Plumbing, Heating and Drains. (LOL). Dan leads worship services, plans memorials and weddings, conducts board meetings, counsels individuals, visits shut-ins and generally participates in groups and events sponsored by the church such as community suppers, fund raisers, family movie nights, Bible study and the book club. On study leave last year, he traveled to the Republic of Korea to visit the Presbyterian Church on behalf of the United Church of Canada, following a partnership agreement. He has just finished a term representing Canada at ACT Alliance serving on the advisory committee for communications. 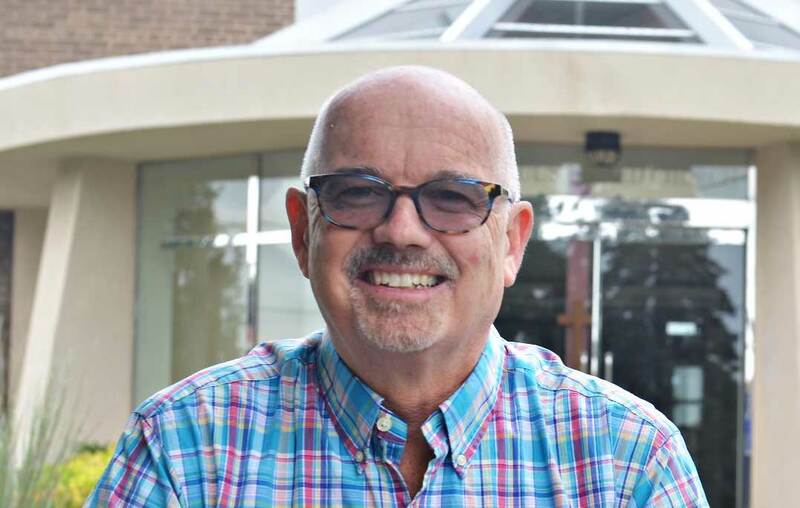 He is also active in numerous other church committees and community organizations including the chaplaincy at U. of T.
Dan arrived at St. Paul’s (at McIntosh and Sandown in Cliffside) in the spring of 2015 after decades of involvement with the United Church of Canada at the General Council Office as the Executive Minister of Communications and General Manager for the Anglican Book Centre. The decision to become a minister was gradual, not an epiphany, but still a gutsy decision in midlife at a time when the church is in transition and “a little bit out of the mainstream in today’s world”. It is all well and good to be SBNR (spiritual but not religious) but attending church creates a sense of community and belonging in a time when friends text or meet on Facebook more often than in person and more people struggle with isolation. Dan is open to the changes in the world and our diverse city; he encourages outreach which respects others whatever their faith or ethnicity. St. Paul’s is a community hub where people of all ages, lifestyles and backgrounds meet almost every day and night of the week for various activities. The church was packed the evening a group of professionals (a doctor, politician, lawyer, and the minister) held a panel discussion on Ontario’s decision to support medically assisted dying. It is a challenge for churches to survive and thrive today so fund-raising and rentals are essential. Space is rented out to various groups with like-minded values making a positive contribution to the community. Five different congregations including a Zimbabwe church meet at St. Paul’s every week. Dan’s work echoes the old adage, “Actions speak louder than words”. His goal is to lead an inclusive, welcoming church which nurtures the community. All the hustle and bustle at St. Paul’s throughout the week is a testament to his success. But who is Dan the man? What does he do in all his spare time? His hobbies include working on his vintage motorcycles and restoring antique watches and clocks. Often he enters the building with a bike or motorcycle helmet slung over his arm. Sometimes he is accompanied by his dog, Keeley, a rescue spaniel. He reads voraciously and writes articles for magazines. He travels with his spouse, Grant, who is a professor of Library and Information Science and an accomplished violinist (frequently a guest musician at St. Paul’s). They have been together for 27 years and were married at The Metropolitan United Church with many of Dan’s parishioners joyfully in attendance.